The Rolls-Royce of geared heads? 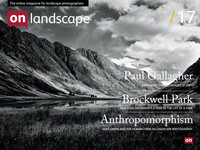 Paul Gallagher is recognised as one of the most accomplished landscape photographers and workshop leaders in the UK today. He has been a writer and lecturer in photography for over thirty years and runs both field and printing workshop nationally and internationally. We'd like to thank Paul Gallagher for taking part in this enlightening video. We talked about everything from composition to use of film developers optimised for scanning. We hope you enjoy and would love to know your feedback.